Calgarian's commercial career lasted only four months. World War I began in August 1914 and on 15 September Calgarian was taken over as an armed merchant cruiser. She served as an AMC for the rest of her life, although on some occasions she transported troops and passengers across the Atlantic. 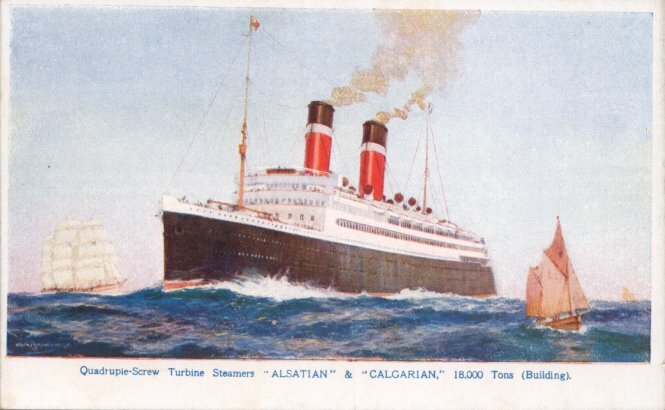 Officially transferred to Canadian Pacific on in July 1917, when Canadian Pacific completed its acquisition of Allan, Calgarian never sailed commercially for her new owner. She was torpedoed and sunk off Rathlin Island by U-19 on 1 March 1918, with 49 deaths. Sources: Haws' Merchant Fleets; Bonsor's North Atlantic Seaway; Kludas' Great Passenger Ships of the World; Williams' Wartime Disasters at Sea.